You can apply to enrol in units at other universities that are not available at your home university. Apply to undertake study at another institution. 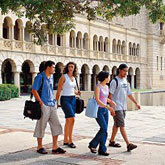 Apply to undertake study at UWA.